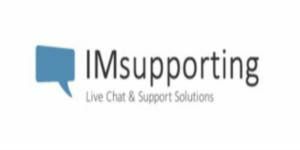 IM Supporting (I’M Supporting) is a nice live chat support software which you can use on your website. However this is a paid service. However the product owner is allowing you to use the software for a free trial. The software is providing different services for you. You will able to track your visitors online and real time with this software, it’s responsive and your clients will able to use the reach you with their tablets and mobile devices. You will able to answer common questions of your clients automatically and you can customize design of your website. If a user annoying you or your service operators, you will able to ban them too. If you are looking for a service which you can get support, you can use this service. IM Supporting is providing this software with a monthly payment to you. Pricing is very reasonable. You can set your package based on your traffic and get the best result with your live chat support service. Watch your visitors real time and see how does live chat effects your sales. Your clients and visitors will able to contact to you when you or your operators are not online. You will have options for banning unwanted users. You will able to respond common questions automatically. You will able to customize your live chat. You will able to see your visits to page. Reasonable prices with reasonable packages. Installation help by product staff. You can get more information about features of this live chat support service from the official website.